After years of looking fly and fresh with a mullet for the ages and a beard that is the envy of Zeus himself, Dainese has taken notice of our very own Hi-Viz Brian and channeled his oh-so-visible swag into the all-new Bryan Jacket. Well, spelling of Bryan aside that is. Must be an Italian to English translation thing. Rugged, durable, and epic in both its attitude and aggressive go-getter ethos, if HVB was a leather jacket, the Dainese Bryan is pretty much what he would be. 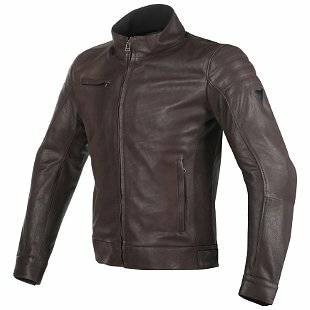 Intricately crafted by the masters of Italian moto design, the Dainese Bryan Jacket makes its mark as a premium, luxurious, and piercingly fashionable addition to the world of cafe racer motorcycle jackets. On the bike or off, the full-grain cowhide leather and tapered cut of the Bryan allows for it to be equally as proficient on the bike as it is at home walking through the city streets. For when the kickstand is up and the throttle is calling, the Bryan features a CE - Cat. II certification for safety, removable composite protectors, and the ability to take either a G1 or G2 Dainese back protector that is sold separately. At the same time, comfort features like the removable thermal liner and waist adjustments allow the jacket to extend its operational range into cooler days, as well as better accommodate various body types. And as for when the kickstand is down, well, the clean, classic, and minimally-branded exterior turns just as many heads as it does when it zooms by at full speed. So, maybe the Bryan leather jacket isn’t the direct namesake of our own Hi-Viz Brian. Even so, however, there is no denying that the two share a very similar blueprint; strong, moto-driven, stylish, and always ready for the camera!